From his humble beginnings as a zygote with a tail curiously shaped like a treble clef symbol, Jim Powell has been involved with music for most of his life. With 2 parents knowing their way around the keyboards and having musical talents, it was only a matter of time till Jim followed in their footsteps. He began formal music training in the 5th grade when he chose the slushpump as his instrument of choice (slushpump being the affectionate name given to the trombone). In the 9th grade, he was one of only a handful of freshman to ever audition and make the roster of the legendary Jazz Impact. Jazz Impact was populated by the best musicians in Lake County’s high schools at that time and was a fore runner of the great jazz bands that most schools now have. Under the direction of Bob Delly and Len Orcino, Jim learned jazz composition and theory for the 4 years he was in the band and appeared with such jazz greats as trombonist Bill Watrous and alto sax player Arnie Lawrence. Impact also appeared on TV, cut an album, were the guest high school band at the Lakeland Jazz Festivals (’75,’76, and ’77), and the Notre Dame Jazz Festival in Indiana (’77). After graduating, Jim saw his peers getting into rock bands. Realizing then that the slushpump wasn’t cut out for leads in any Lynyrd Skynyrd songs, he decided to start seriously playing around with the old white upright piano in his Mom’s basement. Many great musicians came and went through the door of the basement during those “Basement Jam” years. Eventually Jim was asked to join the local band Crystal Rain as its keyboard player. Crystal Rain enjoyed success in the early 80’s doing bar, prom, and homecoming gigs in the NE Ohio area. When the band folded, he joined the short lived band Sybil doing originals and “Big Hair” music of the period. When his son Jim was born, he “retired” for 5 years until former Crystal Rain vocalist Kelly Derrick called him from out of the blue. He said he was putting a Michael Stanley tribute band together and wondered if Jim would be interested. He was, and the rest of that story is history. That band, Stagepass, became a 13 year phenomena in the NE Ohio area, opening for the likes of Humble Pie and Gary Lewis and The Playboys, and playing many festivals, clubs, and benefits. Stagepass also made TV appearances on Fox 8 “In the Morning”, and played with Michael Stanley, Jonah Koslen, and Jennifer Lee. Stagepass was also mentioned in the book “Cleveland and the Rock and Roll Connection” (written by Deanna Adams) in a section about tribute bands from the Cleveland area. Jim was quoted in the book expounding on the “Stagepass experience”! Most Stagepass members say this was the pinnacle of the bands history. As Stagepass wound down, several members wanted to create a new band but with the same energy that Stagepass enjoyed. The Stone Pony Band project was born. For the past 11 years, Stone Pony has reached new heights for a local tribute band, playing in Illinois, Michigan, New York, and all around the state of Ohio. In May of 2013, Stone Pony will play the House of Blues in Cleveland for the 14th time. The band has sold out this remarkable venue twice. Stone Pony also continues to play major festivals around the state and is in demand for its generous donation of their time to needed charities. Notable employers have been the Cleveland Cavaliers, The Red Cross, and Cleveland Autism Society to name a few of many. Stone Pony has also opened for legendary rock bands, including The Little River Band, The Knack, and The Raspberries. Jim also played trombone with the Lakeland Community College Civic Jazz Orchestra under the direction of Larry Smith (who has also subbed as a drummer for Stone Pony). He currently is on an extended sabbatical until his young twins get a little older. 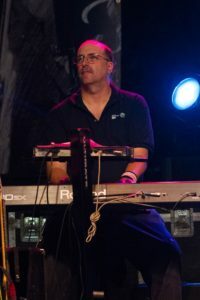 During his time with the orchestra, Jim has played with many notable musicians, including Grammy music award winner Paquito D’Rivera (sax and clarinet), Bobby Sanabria (percussion), and Cleveland jazz greats Paul Ferguson (trombone), Barbara Knight (vocalist), Jackie Warren (pianist), and Dave Sterner (sax). Jim is also very active in the Riverside High School Alumni Band (no, not the International Silver Stings Submarine Band) as a slushpumper. Joining him in that group are son Jim (trombone), daughter Ali (trumpet), and daughter Katrina (sax). Ali attended Ashland University and studied to be a performance trumpet major. She now teaches at Pfabe’s Music in Painesville as their Brass Instructor and also plays with the Lakeland Community College Civic Jazz and Symphonic Orchestras. Jim says “The apples certainly didn’t fall too far from the tree”, and he is extremely proud of his children’s accomplishments and talents. The most current news for Jim is that he and his wife Char are the proud parents of twins that were born May 16th, 2008! Evan and Olivia are getting big and are a handful. But both seem to be displaying some impressive musical talent already. The gene pool continues! Jim currently lives in the booming metropolis of Concord Twp. with the rest of the Powell Clan. His real job is an IT professional with Lake Health, also in Concord Twp.